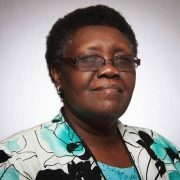 Mary E. Hunt Intro: We welcome you to the ninth 2018 WATER teleconference on Wednesday, October 17, 2018, with Teresia Mbari Hinga, professor at University of Santa Clara. She joins us from there today, a most welcome guest. Like all of WATER’s efforts, our purpose is not simply theoretical. Rather, we are focused on changing the cultural and intellectual assumptions that ground discrimination, exclusion, and destruction. This discussion is our contribution to the dilemmas of the moment—including the difficult situations faced by many African nations in the context of global greed. We hope that our conversation is a small step toward dismantling that kind of oppression. Professor Teresia Hinga is no stranger to WATER circles Teresia Mbari Hinga was born in Kenya. She earned a PhD in Religious Studies/African Christianity from the University of Lancaster in England. Her thesis on the role of women in African Christianity focused on women’s power and liberation in the African Independent Church. Dr. Hinga is an associate professor at Santa Clara University and works in the Department of Religious Studies. Her scholarly/research interests include Women and Religion as well as Religion and Public Square. We know one another from Catholic feminist circles. Dr. Hinga’s book, which she will discuss today, African, Christian, Feminist: The Enduring Search for What Matters (Orbis Books, 2017) examines her journey from Africa to the Silicon Valley. She writes from within the Circle of Concerned African Women Theologians to show the concrete impact of feminist work in religion. Her focus on HIV/AIDS, land and water issues, violence against women, and many related themes make this compendium a valuable teaching and learning tool for a broad and appreciative audience. We are delighted to have you with us on this WATERtalk, Dr. Hinga, and we look forward to your remarks. Teresia Mbari Hinga: I will start by contextualizing the title: “African, Christian, Feminist.” Africa is the context to and from which I speak. I additionally speak as a Christianized African thus I have “dual” theo-ethical citizenship (i.e. African/Christian). The title draws attention to the fact that I speak as a feminist. Often the term is considered suspect but I adopt Elisabeth Schüssler Fiorenza’s definition: “Feminism is the simple notion that women are people.” Feminists challenge practices and systems that subvert women’s “peopleness.” To describe such systems I adopt the term Kyriarchy, a term that was also coined by Elisabeth Schüssler Fiorenza. The term extends patriarchy to encompass and connect to other structures of oppression and privilege such as racism, ableism, capitalism, etc. The book is dedicated to my parents Agnes and Ernest, pioneer African Catholics who lived their faith with courage and simplicity. They taught me that faith matters and that Christianity can be a Liberative force despite many ambiguities. I consider my parents feminists despite the fact that they didn’t know the term feminist, which is not translatable in my language. My parents’ feminism shone through in their gender-free parenting, treating both male and female children as equal (for example they sent all of us to school). This was in a time where tradition dictated otherwise. My book is a collection, a selection from my many essays written over time (40 years) reflecting my take on multiple issues of theological debate and concern in Africa and beyond. Though the essays are a result of my own intellectual curiosity and ethical concern, they have been nurtured in community. The method of choice is Palaver. Rather than just having academic debates about issues of concern, in collaboration with each other, concerned African scholars are discerning together what the issues are and seeking to address them together in community. The Circle of Concerned African Women Theologians is a major context where my thought has been shaped in community, Palaver, and conversation. Other contexts include the American Academy of Religion as well as the Catholic Ethics in the World Church project first convened by James Keenan (Boston College in 2006). The first essay I will highlight is the Kimpa Vita story and its implications. Kimpa Vita was burnt at the stake in the 1700s for challenging the ambiguities of missionary Christianity and its seeming support for colonialism and even slavery in the Congo. She reconfigured a fashion of Christianity determined to revive the Congo Kingdom and becomes, at least in my view a proto-feminist for her struggles against colonialism. Kimpa also suffered martyrdom because of her gender. As a mother and “prophet” she was considered an imposter as a religious leader, similar to many women today where it is frowned upon to be a religious leader while raising a family. The Kimpa Vita story is an African women’s story. It is a story of courage and resilience despite many odds. It is a story of feminist agency long before the term feminist came into vogue even in the west. It is an example of a hidden story. Few know that she was burnt at the stake, she and her child. This is the kind of “her-story” feminists, including African feminists are determined to write back in history. Thanks so much WATER for the opportunity to speak on and about my book. I truly appreciated the opportunity and conversation. Q: Are you coming to the Parliament of World Religions in Toronto next month? What is the influence of Pentecostalism in African Christianity? TMH: I have been invited to the Parliament of World Religions in a session featuring Dr. Vandana Shiva an Indian scholar activist and globally known eco- feminist. The topic of the session will be on food democracy and sovereignty (Sunday, November 4, 2018). Regarding Pentecostalism – This is one of my areas of research is religion in the public square. Recently I was involved in large-scale collaborative research around Neo-Pentecostalism and its role in the African public square. We focused on how Pentecostalism is shaping the discourse around HIV/AIDS, conflict, peace, and poverty. The outcomes of that research are waiting to be published. There is a lot of energy around the whole area of Pentecostalism – it’s ambiguity and its potential for women who get energized by it. Q: Tell us more about the Circle of Concerned African Women Theologians. The good and great Mercy Oduyoye has graced our office, and Diann and I saw her at the opening event of the Center for Womanist Leadership in Richmond in April, 2018. What is the relationship between the Circle and the Center for Womanist Leadership? Three-part question: What’s the relationship? What is happening? How do you see Catholic Women interfacing in there? TMH: From day one, African American women were involved in Circle affairs. In 1989, I was a founding member of the Circle in Ghana. Both Katie Cannon (RIP) and Jackie Grant were there. This time marked the beginning of the relationship was Between The Circle Women and Womanist Theologians. There has since then been many collaborative events some organized by Womanist Scholars in collaboration with Talitha Qumi Center founded by Mercy Oduyoye as a “home” for the Circle. A recent Between African and African American women (or as they preferred to call themselves Africana Women) focused on the whole question of scriptures and how we read the scriptures as African Women can be found in the edited volume titled Unraveling and Reweaving Sacred Canon in Africana Womanhood (Rowman and Littlefield, 2015). Sometimes women (and men) hesitate to join an organization that describes itself as feminist (especially if they come from Catholic circles). My hope is that the stigma that feminism is a bad idea will be debunked and many more Catholic women and men will join hands and be more proactive with their prophetic voices in all corners of our existence. We do have African Catholic participants but we could have even more. The question is how do we bring them in? MEH: I’m reminded of the work of Sister Margaret Farley of the Mercy community. She has been part of the All-Africa Conference: Sister to Sister – a project intended to bring together African women religious to develop strategies for responding to the pandemic of HIV/AIDS in Africa. That is another place where Catholic sisters are moving in Africa on these questions. WATER thanks Teresia Mbari Hinga for this informative presentation. Please join us for our next teleconference, Wednesday, November 7, 2018 from 1PM – 2PM “Holy Women Icons: Folk-Feminist Iconography and an Intersectionality Ecofeminist Philosophy of Creativity” with Angela Yarber.